After taking the strong step on the ban of travel to the US by citizens from seven Muslim countries as an executive order; now Mr. Trump softens stand on immigration. US President Donald Trump called for a “merit-based immigration system” during the congress address on Tuesday night (February 28th 2017) that could benefit high-tech professionals from nations around the world especially India and big IT companies hiring foreign workers. “Nations around the world such as Canada, Australia and many others, have a merit-based immigration system,” he added. It is a basic principle that those seeking to enter a country ought to be able to support themselves financially. During his presidential campaign, Trump had promised to increase oversight of our H-1B and L-1 visa programmes. He offered a far broader approach favored by Republicans for reshaping the nation’s immigration laws. Keeping his election promises, Trump maintained a hardline on illegal immigration, exclusion of people from countries where it is difficult to inspect applicants for visas to travel to the US. 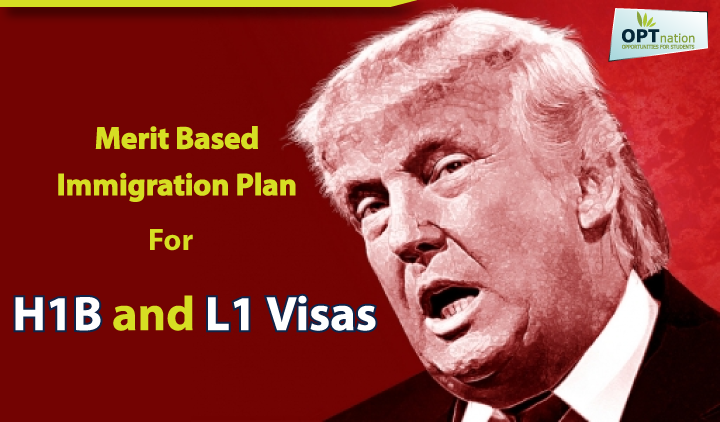 Following this anticipation a legislation in January 2017 H1B Visa reform bill has been introduced in the US House of Representatives which among other things calls for more than doubling the minimum salary of H-1B visa holders to $130,000, making it difficult for firms to use the programme to replace American employees with foreign workers. Trump appealed to the Democrats for bipartisan support for immigration reform. “If we are guided by the well-being of American citizens then I believe Republicans and Democrats can work together to achieve an outcome that has eluded our country for decades,” he said. “Switching away from this current system of lower-skilled immigration, and instead adopting a merit-based system, will have many benefits: it will save countless dollars, raise workers’ wages, and help struggling families — including immigrants — enter the middle class,” he said. President Trump said he believes that real and positive immigration reform is possible as long as it focuses on the goals to improve jobs and wages for Americans to strengthen the country’s security and to restore respect for laws. He said the construction of a “great wall” along the southern border will start soon and building a wall along the border with Mexico. What can be the reasons behind H-1B rejections or H-1B visa denial? Merit-based immigration system could benefit Indians. This merit-based immigration system is likely to give Indians an edge because large numbers of the diaspora has high education and skill levels. Indian IT professionals account for the largest number of foreign nationals coming to the US on H-1B visas as well as scientists, doctors, engineers and other highly-skilled professionals. Indian software companies could finally breathe a sigh of relief at US President Donald Trump’s call for a “merit-based immigration system” in his first address to the joint session of Congress. However, senior government officials said that while they agreed that such a system could benefit professionals from India, they were still watching and analysing the moves of the US administration. In an op-ed eminent Indian-American legal luminary Ved Nanda had warned the Trump administration last week that any curb on H-1B visas would result in flight of talented Indians from the US. How the reform would ultimately affect Indians could eventually depend on how country limits the use of foreign work visa and the number of employment visas are handled and also on the retention of the immigration privileges for brothers and sisters of citizens and their families.